In this episode, Stewart investigates what it means to "follow the energy" in painting and in life. An excerpt from Following the Energy . . .
Energy is the guide that we listen to when we’re doing process painting. It's something that’s very natural to us, but at the same time it's radical. It's radical because it does not follow the dictates of the thinking process. It's a different stream of the psyche, it comes from a completely different level, and it's not about pleasing our aesthetic or pleasing our need for meaning or recognition. It’s got a completely different agenda. And it's not an agenda that we can know, like we know other agendas. It’s something more profound than that -- it has to do with our own growth; it has to do with our own destiny; and it has to do with our very purpose for being on the earth. And there’s an intelligence to it. It has direction and it's different for each person. And the way that it manifests is through what I'm calling "energy." 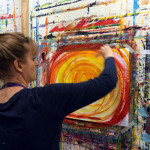 This energy is what guides us in the painting process. Sometimes people refer to it as, “Not me painting, it's the brush painting.” Or, “It’s the painting that's painting.” And by saying that they’re recognizing something -- that it's not coming from an intention of the conscious mind, it's not coming from some direction imposed by what we think we should do and what would look good and what would be meaningful. On the contrary, it's got its own imperative and its own force. We experience it through the fact that the brush wants to do it, the color talks to us, or the gesture just feels right.